A year ago today was a workday for me: part-time Art Bank Technician with the Government of New Brunswick’s Department of Wellness, Culture and Sport. I picked up a rental van at Budget with “my” work-required corporate AmEx card, loaded it, and went to Maryville Place. My supervisor phoned my gnb-issued cell phone to request a meeting in late morning. I went not knowing what to expect. Unexpectedly, I was given notice that my contact was being terminated effective that day, 18 months to the day of when I started work there. They expected me to continue working through the afternoon, to refuel and return the rented van; to clear my personal possessions out of the office cubicle; and to return the government’s belongings (including keys, DOT fuel cards, work orders, and my security/ID/building access card) that afternoon—trusting that I would do the honourable thing rather than abandon everything and simply walk away. While I had previously been wondering just how long I would have continued in that job with its long hours driving winter roads—risking my life for government-owned New Brunswick artists’ artworks—I had not expected abrupt termination. Several months earlier I had made application to UNB’s School of Graduate Studies and the Faculty of Education for the MEd program I am currently in. On March 24, 2009 I did not know the status on my application. I wondered whether I had sufficient work hours to be eligible for Employment Insurance? I wondered whether I should immediately look for another part-time or full-time job? I wondered if I could ramp up Broken Jaw Press, meet the due 15 April provincial publishers’ grant application deadline, and aim to apply in the autumn for reentry to the Canada Council for the Arts publisher programs? A week later, on April Fool’s Day, I received my Certificate of Acceptance from UNB. Without the part-time government job, I wondered if I could consider attending UNB full-time? Six days later my life was again turned upside down as I was made homeless, sidetracked, and intensely preoccupied by the fallout from a fire that destroyed the apartment building where I had lived for almost 11 years. In association with World Poetry Day (21 March) and the 10th International Multicultural-Multilingual Poetry Reading and Poster Poem Exhibition, organized and founded by Nela Rio. Sponsors include Ashes, Paper & Beans: Fredericton’s Writing & Art Show, Broken Jaw Press, Capítulo de Fredericton de la Academia Iberoamericana de Poesía, and revue ellipse mag . . .
Indie, small and micro-press publishers: books and chapbooks of poetry, fiction, artist multiples, artist books, broadsheets, postcards, zines, lit mags, literacy info & much more . . . Location: Gallery ConneXion, 470 York St, Fredericton, NB. Open Mic and scheduled readings may be recorded for broadcast on Ashes, Paper & Beans: Fredericton’s Writing & Art Show on CHSR 97.9 FM. Exhibitor fees: tables $10 (full tables only). Payable to: BS Poetry Society, Box 596 Stn A, Fredericton NB E3B 5A6. Doors open @ 11 AM for exhibitor setup. Contact (506) 454-5127, joeblades@nb.aibn.com to reserve tables and readings. 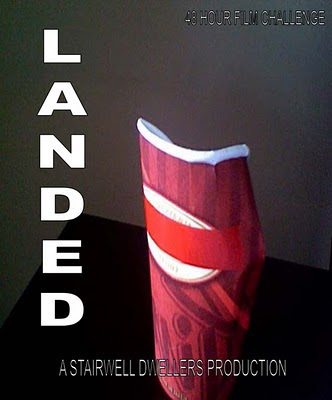 The mocumentary short film, Landed, was written, filmed and edited within a 48 hour period by the Stairwell Dwellers team of ten people after receiving an “inspiration package” anonymously prepared by one of the other 11 teams in the Fredericton 48 Hour Film Competition. Landed is the story of an alien who crashed lands near Fredericton, and of the misadventures that befell him during his quest for fuel. The short comedic drama is framed inside an episode of a fictitious television program, The Panopticon. It consists primarily of an interview by Leonard Peck (Joe Ross) with the unnamed Alien (Joe Blades; Alien’s voice by Jared Mallard) and the Alien’s friend–interpreter (BronweN) with an artist’s re-enactment and flashbacks. The 48 hour period began at 5 pm Friday, 12 March, 2010. Stairwell Dwellers was led by two UNB MEd candidates, Matt Rogers (in Critical Studies) and Joe Blades (in Adult Ed). The rest of the crew consisted of high school teachers Matt has been working with, one youth from previous filmmaking pedagogy projects of Matt’s, BronweN (upon finding out that Joe Blades had/was in a team) and the partners of several of the crew. All participating teams received an inspiration package prepared by another team. The package consisted of a “location”, an object, and a photograph—all of which must be used in the making of a short film under 10 minutes in length. Stairwell Dwellers received “spaceship” as a location; a large 11" x 14" colour of someone on Team #1 as the photograph; and a green glove with dangling Easter egg-coloured fuzzy balls (a cat toy?) as the object. The Fredericton 48 Hour Film Competition will host a screening of all of the completed film on Tuesday, 16 March, starting at 7 pm, in MacLaggan Hall Theatre, 33 Dineen Drive, UNB–Fredericton. A The Gala Screenings of the top three films with awards presentation will happen on Sunday, 21 March, starting at 7 pm, at the Garrison District Ale House, Queen St, Fredericton. The Barry Awards take place on Saturday, March 27th, and you all are invited! This is the way CHSR recognizes our programmers with an evening of fun and frolic, with entertainment, food, etc etc and since it is the countdown to our 50th anniversary, this will be a big one! Below are the award categories, the shows and programmers that qualify. Check them out! Everyone, whether a member or the listening public, can vote! Lone Cloud: Rita Joe poem "I Lost My Talk"